← Coming Home & Christmas Poll Results? This a wordy looking post but I think it’s worth the read for the fun and games we had! My car has been down the drive just round the corner from me, where it has remained for the last year and a bit, I can work as and when I wanted to on it so there was no real issues. So there you have it, my car is at her rightful home at long last, gentlemen I thank you for your help. Ooh, I nearly forgot Staci who collected Mark to take him home before his next shift! The car was in the garage, so the next thing was to rig up an extension to the solar trickle charger for my battery. (A review for that bit of equipment can be found here.) Hole through the garage wall and it was job done, that’s after we spent after we spent the best part of half an hour looking for the clips to the battery so that we could use a length of good quality speaker cable to extend the wire. A big day for the man and his Mustang it has to be said. I was out there today having a little fiddle around, as you do of course, to see what the next job is going to be. I have a feeling it will be to revisit some of the work I have already done. Such is life, but she is home! The next installment I doubt will be as long. 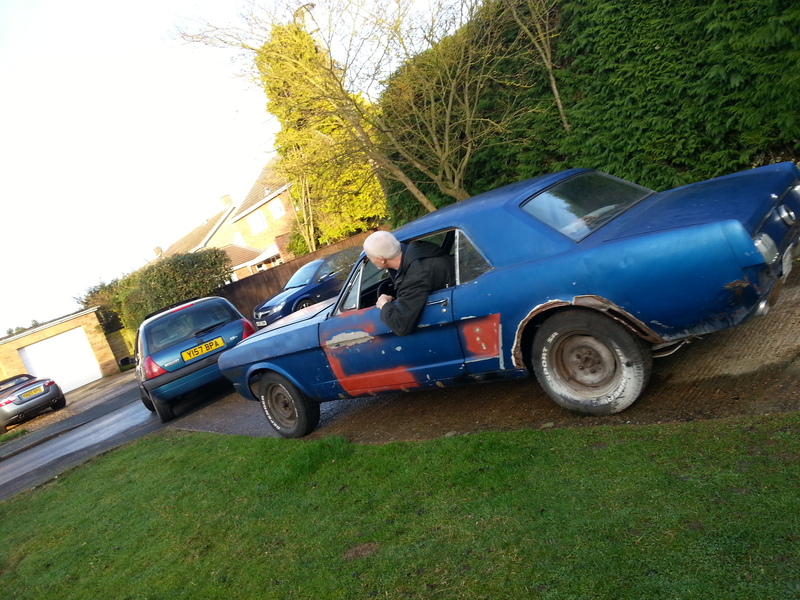 This entry was posted in Car, General and tagged charity, chrome, drive, garage, home, hospital, Mansell, muscle, Mustang, photos, puncture, review, shiny, solar, steering, tight, towed, Tuff Stuff, tyre. Bookmark the permalink. for just about all my life. It’s a great way to feel a sense of accomplishment. Good luck and if there’s any tech info you need, just ask . be good and Love life. Thanks for your comment, it seems to make all the effort worth while when somebody reads and enjoys what I have done and written. I am always after info on the 66 Mustang Coupe. Please send me what you can, tips on bodywork, rust treatment, chrome preservation, in fact anything classic car related. You never have enough info. Thank you.